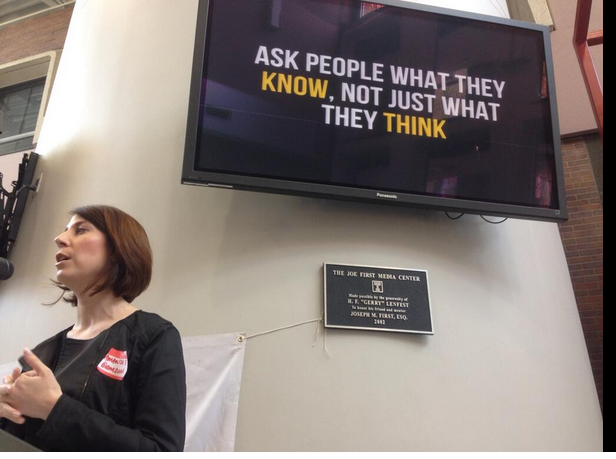 Three takeaways from Saturday’s BarCamp NewsInnovation, the largest ever. I won’t name all of the journalists from the Daily News, Inquirer and Philly.com who came to BarCamp on Saturday, because I’m sure I’ll miss someone and piss them off. But there were about 20 of them there (yeah, I kept track) and it was both a noticeable and important change. BarCamp is the premiere local journalism conference and it was great to see so many smart, passionate journalists from the city’s top media institution. One of my favorite parts of the day was introducing Inquirer reporter Bob Warner, who has spent his career finding and digging into data, and the Washington Post’s Greg Linch. I could only imagine the magic that the two of them could pull off together. I won’t pretend to understand everything that Linch was talking about in his interpretive dance session connecting abstract art with the future of news. …and take our passion from outside of journalism to make our work better is right on and it was a refreshing way to start the day. 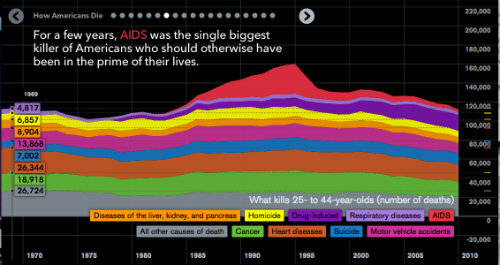 One of the examples I used in my session on thinking beyond articles (more on that later this week) was Bloomberg’s “How Americans Die” feature. Sure, those 20 slides could have been boiled down into an article, but who the hell wants to read that many words about death? Presenting it how they did at once made it more abstract, but also much more clear and much more engaging. And, yes, beautiful. As Helen Ubinas and I were roping Daily News Assistant Managing Editor Gar Joseph into coming Saturday, he shot back that he only goes to journalism conferences where business models to support quality content are discussed. No one on Saturday could give Gar a magical answer. But just having that many smart and passionate people under one roof THINKING about the answer is part of the path to get there. Perhaps the best part of #BCNI14 was seeing Amanda Zamora’s keynote being turned into action in real time around the story of the police in the Daily News’ Pulitzer prize-winning “Tainted Justice” series not facing charges. Joel Hoffmann weighed in from SAN DIEGO and Faye Anderson had a Google Form up to collect #MyPhillyPD stories by the end of the day. Much more to come, I’m sure. And once the excitement around the day and the spam bombarding #bcni14 subsides, that’s really what matters: Using the lessons of BarCamp to do great journalism (and make money doing it). Can’t wait to see what that looks like.